One night, I had walked into Marco's Pizza, a new pizza joint near my house, just to check it out but could not resist the call of temptation from the very well placed cake chiller..... 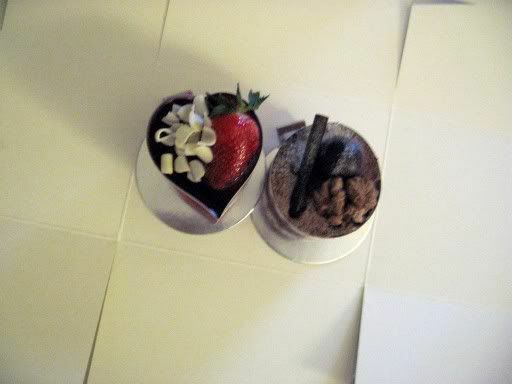 The cakes, were teeny (akin to Bakerzin's sizes) for RM6 but looked really good, so I thought I should give it a try. The Chocolate Cake, with layers of chocolate sponge and mousse, was a bit on the dry side, although the generous toppings of a chocolate stick, walnut and (hollow) chocolate ball were enjoyable. The cute heart shaped Strawberry Cake, with its layers of vanilla sponge and strawberry mousse, was also a bit on the dry side *sigh* but the jellied strawberry on top was nice. So, all in all, it was ok but just not quite worth the price. Hey J, guess what? I caught these cakes at Da Breadstory. 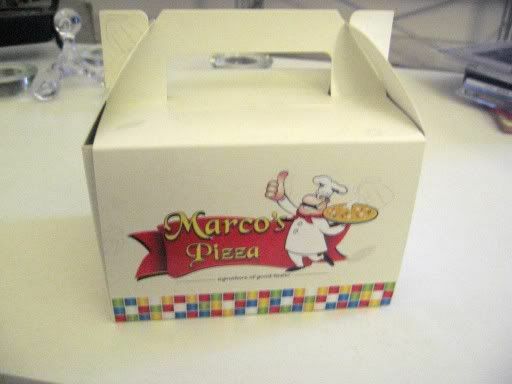 So, I assumed that Marco's Pizza eventually ordered these mini cakes from them eh... honestly speaking, it was not really good da other time I had it @ Marco's Pizza..
Oh... so they're getting it from somewhere else! Hmmm - not very original then, is it? Anyway, I didn't find them very nice either... not really worth the price.